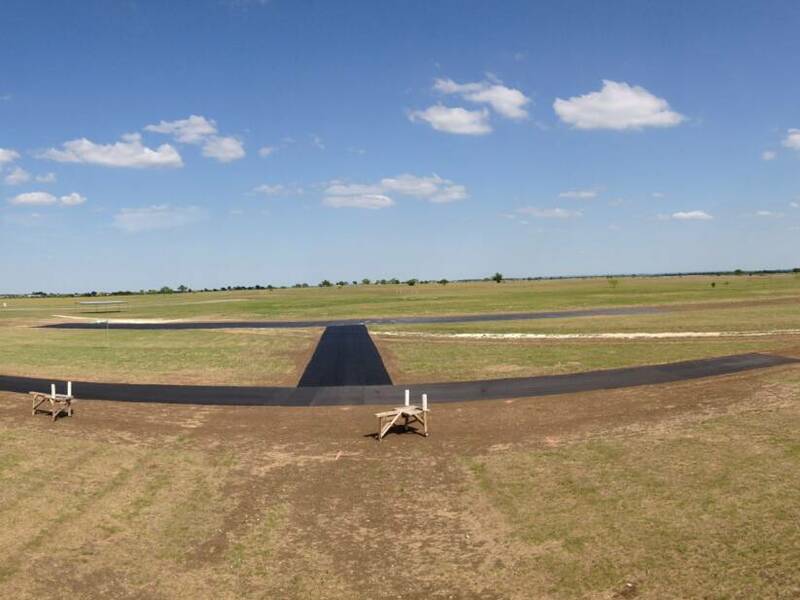 After 4 weeks of prep work, the new runway, taxi way and pit area are now completed. Rodney Nichols was able to get the new runway grated and loaned us the roller we needed to get everything as smooth as possible.Brian Ford loaned us his tractor to do the dirt work Brian and Todd completed all dirt work. Before the fabric was put down, Max and Sally Blose spent 2 days using RoundUp to kill weeds. Also, over the past 2 weeks Max Blose and Danny Jackson mowed 75 percent of the field (25 acres) and Brian Ford shredded the rest. I would like to thank the members that were able to come out to the work party Saturday, the 27th. We had everything installed in 3 1/2 hours with everyones help. I would like also thank all of the club members for their donations. Without them we would not have been able to get this done. We now have a 1st class field to fly off of. in the next couple of weeks. Ed Snow, Butch Zalmer and Rodney Nicholes for all of support from the city of Valley Mills. 1. What size is your fabric runway? 2. What preparation is needed before laying the fabric? 3. How is it installed? It is held down by 8in staples approx. 8” apart at all edges and seams. once the fabric tightened up we added more staples in between each 8" foot staples. 4. What maintenance is required during the season? The only maintenance required has been to kill a few weeds working up thru the seams and to patch a few bad prop strikes. 5. What needs to be done each spring? Check to make sure each staple is down. 6. Any winter preparation needed? No winter prep has been needed. 7. How easy is it to repair and what was used on the seams? 8. How long has your fabric been down? 9. How is it repaired? 10. What glues have you used and what works best? Again, see question # 7. 11. How long will it last? This is the info we have from other clubs that have the Fabric.... "We are guessing 6 years in Michigan, but a club in Texas has had it for five (5) years and they expect it to last much longer." 12. What are the problems with the fabric runway? (A) You must have a very slow idle. (B) If a plane noses in or crashes on the runway real hard, it can put the prop nut thru the runway or the prop may slice thru. However most of the time it does no harm. 13. Why did the club go to a fabric runway? Even small electrics can take off with no problems, as well as fuel powered scale planes with retracts. See Question # 12 - ALSO sometimes extremely small tail wheels may catch in a seam while taxiing. 14. How do the club members like the fabric runway? 15. What do jets do to it? How many members fly jets? Currently, no one regularly flies jets off our field, but we have been told that they do not affect it. 16. What care must be taken while mowing? How close do you get to the fabric? Our mower just overlaps the edges of the runway and has had no problems. 17. How have you oriented your runway to the prevailing wind? yes , Our runway runs North to South. 18. Do you know other clubs that have used the fabric? There are several other clubs that we know of, One of the clubs is in Nederland Texas and we talked with Kent Radio Aero Molders in Alto MI for lessons learned. 19. Does it stay tight? 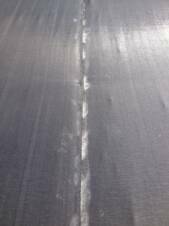 The Runway material stretches tight in the sunshine and stays tight all year round. 20. Does the wind damage the runway? 21. Does glow fuel, gas, or the exhaust damage the Fabric? One of our members made up a tool for putting the Staples in and this made the install much easier. With one worker loading them, and another driving them in, it goes surprisingly fast. 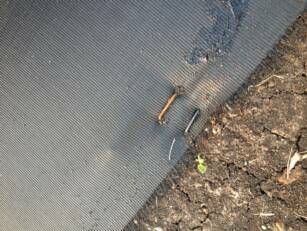 We just rolled the fabric out and pulled it out fairly flat before stapling it down. In a few hours of warm sunshine the fabric stretches tight. It is useable within a couple of hours. We added extra staples at each end once the runway was rolled out. Make sure to put the staples as close to the edge as possiable this will keep the edge from rolling up After 1 week in the sun we have added more staples to each side to ensure the sides would stay down We had the whole runway done in approx four 3 1/2 hrs and started flying off of it the same day. Make sure not to get the fabric to tight when installing, just pull it tight by hand the sun will smooth it out.